The CWI-DC850H is a 3600 cfm stationary cyclone dust collector with automatic cleaning of the canister filter. When the user turns the machine off a motor mounted to the canister cleaning mechanism will automatically rotate for 30 seconds forwards and another 30 seconds in reverse to clean the canister filter. The DC850H has a 5 HP/34 amp 220 volt motor with a magnetic safety start switch and remote start/stop control. A cyclone dust collector is designed differently than standard single stage dust collectors in that the cyclone does not allow the dust particles to travel through the impeller. On single stage collectors the impeller draws the dust through it and then pushes the dust through to the filters. A two stage (cyclone) dust collector pulls the dust into the cyclone area of the machine and forces the dust downwards straight into the metal dust storage drum. Only the very very fine particles of dust can travel into the impeller and then through to the filtration. Because almost 100% of the dust never actually gets to the filtration area the filters stay very clean for much longer periods of time. With a single stage collector the dust not only fills up the cavity of filtration it also quickly dirties the filters causing a reduction in the flow of air until emptied and cleaned. 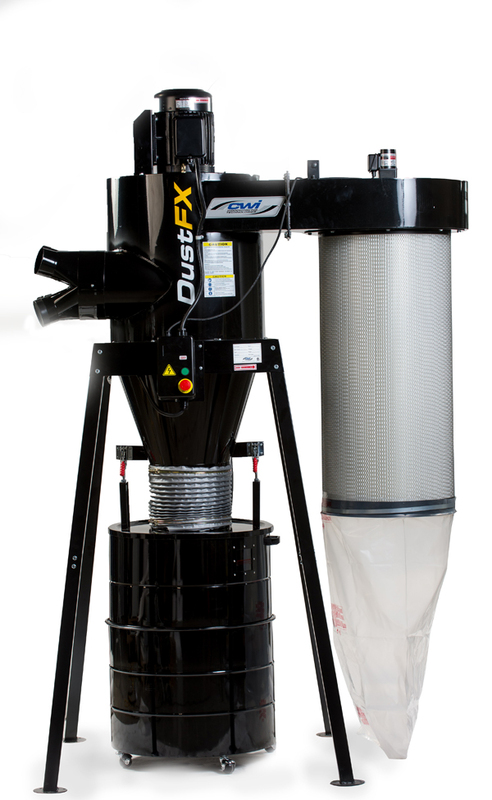 The cyclone dust collector (two stage) remains very efficient with virtually no disruption of air flow. 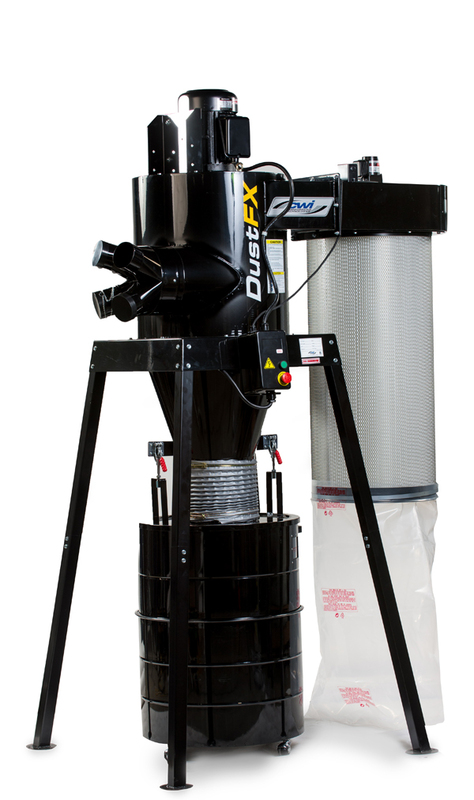 In addition to the efficiency of the cyclone process the CWI-DC850H also features a very high performance “Hepa” manual clean canister dust filter. Advanced performance Hepa filtration will filter out 99.97% of dust particles .3 micron and 100% of all dust particles .5 micron and larger. 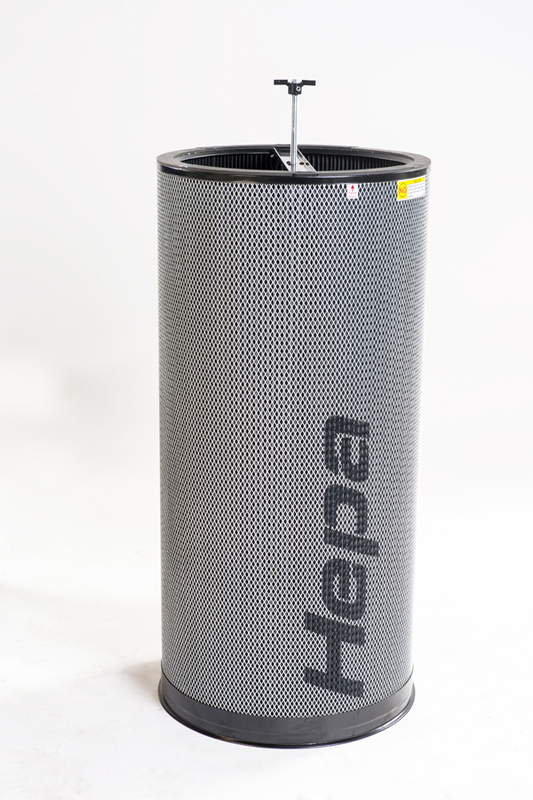 Attached to the Hepa canister filter is a small plastic bag to collect the very fine dust particles that do make their way to the filtration compartment. This bag will get emptied very seldom while the metal dust drum attached to the cyclone area is a breeze for dumping regularly.